One of the people I looked up to when I was growing up is a man named Flip Nicklin. He is National Geographic's top cetacean photographer, the person who was responsible for many of the wild-eyed dreams of my youth, those in which I ventured into the deep-blue ocean to swim among whales and dolphins. That's pretty much what Flip has been doing for his entire adult life, and yesterday, I had a chance to talk with him, thanks to the magic of the internet. 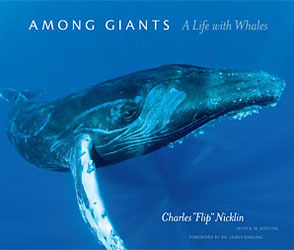 Flip has recently launched a new book called Among Giants, A Life with Whales, which contains photos and stories from his countless adventures with cetaceans. During our 20-minute chat, Flip tells me about how he got started (turns out that cetaceans are sort of a family business! ), relates a few of the tales from his book, and shares some perspective on how the relationship between humans and cetaceans has evolved over time. And of course, if you'd like to purchase a copy of Flip's book, it's available at book stores and via online retail outlets, but I'd recommend purchasing via the Whale Trust site, as the highest amount of money ends up going toward whale research. The book is also available as an iPad App on the iTunes store: Among Giants iPad App.